After many months of agonizingly slow sales, automakers and dealers are anxiously counting on the cash-for-clunkers program, getting under way officially on Monday, July 27, to help clear their lots. They’ve got good reason to be nervous. 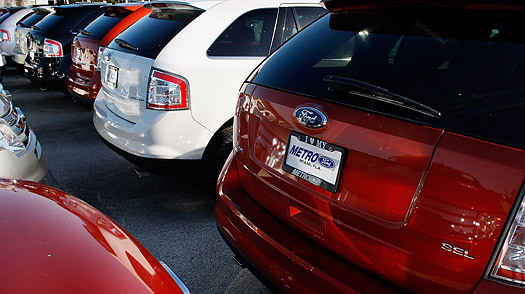 With sales running at less than 10 million units annually  the lowest level in more than three decades  there is still a mountain of inventory sitting with dealers around the U.S. despite deep cuts in production, not only by the bankrupt General Motors Corp. and Chrysler Group LLC, but also by companies such as Toyota, Ford and Nissan. With production reduced, dealers have been working off their swollen supply in recent months and many have offered substantial deals. But the inventory problem has been complicated by widespread dealer shutdowns  no change in inventory but fewer dealers to sell it  so the correction process is far from complete. Carmakers had nearly 3 million units on hand at the end of 2008 and could have any many as 2 million units in stock by the end of 2009, according to an estimate by the consulting firm PricewaterhouseCoopers. The numbers, however, don’t tell the whole story because the start of the 2010 model year is only a couple of months away  it officially kicks off Oct. 1  and once that happens the sea of 2009 models now sitting on dealer lots will suddenly depreciate. Who’s most vulnerable While 50 to 60 days’ supply of cars is considered ideal, Chrysler is sitting on a 71-day supply and GM has an 82-day supply even after keeping most of their factories shut since the beginning of May. Some foreign-based automakers had even higher numbers: Suzuki has a 108-day supply, Jaguar dealers are sitting on a 92-day supply, Mitsubishi stands at 84 days and Mazda has 78 days of supply, according to estimates from dealers collected by J.D. Power & Associates. Honda, which traditionally has kept inventories lean, has a generous 64-day supply; Daimler’s Mercedes-Benz and Smart units, also lean players, have a combined 63-day supply of vehicles. Even Volkswagen, which has been aggressively promoting its cars while other carmakers trimmed advertising, had a 78-day supply of autos during July, according to J.D. Power & Associates. Yoshimi Inaba, the new head of Toyota’s operations in the U.S., says the company’s inventories have dropped to manageable levels . However, the cost has been steep. Toyota’s operations in the U.S. are no longer profitable and Toyota overall probably can’t make a profit if it’s losing money in North America, Inaba has acknowledged. Now comes that badly needed boost, the cash-for-clunkers law signed in June by President Obama, which offers $1 billion overall for consumers who agree to trade in their old vehicles for new, more fuel-efficient models. The initiative could boost car sales in the U.S. by about 200,000 units, PricewaterhouseCoopers estimates. To piggyback on the cash-for-clunkers scheme, car dealers are stepping up advertising and manufacturers are offering their own incentives. Chrysler, which has watched its sales dwindle this year to the point where, according to Edmunds.com, it is now in seventh place in total sales in the U.S., plans to match the federal rebate dollar for dollar. Any consumer shopping for a new vehicle will qualify for the program, which offers up to $4,500 for the purchase of an eligible 2009-model-year Chrysler, Jeep or Dodge vehicle through the Double Cash incentive. Mike DiGiovanni, GM’s general director of market analysis, says the federal program is also expected to encourage consumers who have leased vehicles in recent years to get back into the buying market. At the very least, DiGiovanni hopes to arrest a frightening trend: more than 50% of the buyers who have turned in leased GM vehicles in recent months have opted not to replace them. “It’s an astonishing figure,” he says. “Starting this [weekend] we’re going to be running ads across all of our core brands that specifically mention cash for clunkers,” said GM spokeswoman Susan Garontakos. GM is also mounting a direct-mail campaign designed to explain the program. Garontakos adds that these programs are in addition to specific financial incentives ranging up to $4,000 that GM offers on slow-selling models. “Our dealers are looking for an uptick in sales,” she says. See the history of the electric car.